Had a chance to collaborate with my brother on his new show The Man The Sea Saw. 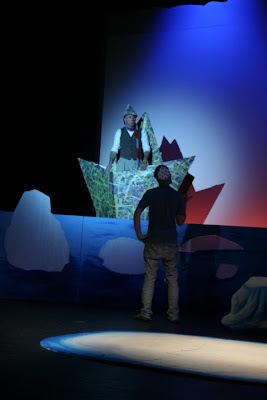 I designed and conceived the set, made puppets, and painted painted painted. I had a great time spent with all in Arizona. Some amazing people and such a strong family connection. It was a great experience and only the beginning. Here is a pic of me on the set with Wolfe in a boat made of comic books.